John G. Fuller Warns Betty Hill Not to "Jump to Conclusions"
Betty Hill (1919–2004), who with her husband Barney was allegedly "abducted' by a UFO back in 1961, is an extremely well-known figure in UFO circles. We know her from the book The Interrupted Journey by John G. Fuller, by countless media articles and appearances, and from her appearances at UFO conferences. The conventional wisdom is: she was a serious and credible person who reported an incredible experience, but in later years became somewhat fantasy-prone because of something akin to a post-abduction syndrome, worsened by ther husband's sudden death. A more realistic appraisal would be: Mrs. Hill was a fantasy-prone person, who nonetheless succeeded in convincing a lot of people she was credible before the weight of evidence made it obvious that she wasn't. A graduate of the University of New Hampshire, after her death Mrs. Hill's papers were donated to her alma mater, and now are available to researchers at the Milne Special Collections, University of New Hampshire Library, Durham, NH. Skeptic Kitty Mervine has been studying these papers, and has made some extremely interesting findings. We did see some slides of a group of Indians in Antarctic who resembled these humanoids very much- both of us were very shocked by this. They had fatty layers of tissues around their features to protect them from the extreme cold of their environment – a warm day is 40 below and they go swimming. From this Betty concluded that the aliens must have originated on a very cold planet. Betty didn't explain how the natives find liquid water when it's 40 below. So now when he comes to visit, he brings his mother and we have great times together. When they were here in October, we went out to my area and counted 12 UFOs in thirty minutes. His mother was amazed! Betty Hill with "Junior" and UFO promoter Timothy Green Beckley, who took pictures at the "UFO landing spot." 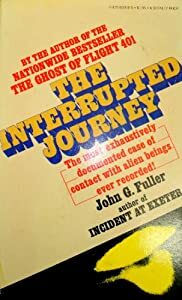 However, one visitor to the "UFO landing spot" was not so easily impressed: John G. Fuller, the author of the book The Interrupted Journey that made the Hills famous, who regularly wrote for major magazines such as the Saturday Review and Look. (Remember when people used to read magazines for news and current events?) Fuller was a firm believer in UFOs, ghosts, and other paranormal claims, but he could not stomach the UFO claims being made by Betty Hill after her supposed "abduction." during the evening we went out with you, there was nothing that appeared that could not be identified as planes on a normal traffic pattern for either the Boston airport, the Pease Air Force Base, or the traffic route for overseas passenger jets. Yet you had a tendency to feel that some of these were UFOs....to misinterpret aviation traffic as the [unidentified] objects does not help your case. Because your first encounter was so well documented, it served as very good evidence of the existence of UFOs. Unless you can back up any current happenings with equal caution, you can seriously harm your position, and that of those who found your original evidence so interesting because of your reserve and caution. Hate to speak as a Dutch uncle like this, Betty, but it is very important to do so, if only for protecting your own reputation. In another note (undated), Fuller admonishes Betty to, "never extrapolate, always re-check and look for natural explanation first." That is so un-Betty! "It's so easy to jump to conclusions, and when you do, you can weaken your position drastically. Alexander wrote a book on his UFO investigations called “UFOs: Myths, Conspiracies, and Realities.” In the book Alexander pointed out that although UFOs are real, they are of no interest to the American government, and therefore there is no cover-up of the facts by American officials. Paradoxically, while denying that the U.S. military is involved in any UFO coverups, Alexander is a strong proponent of the famous Rendlesham Forest alleged UFO landing, which took place in England in 1980 but involved U.S. Air Force personnel. The U.S. Air Force operated the base at Woodbridge, as part of the NATO defenses against possible Soviet agression. So apparently Alexander believes that the U.S. Air Force does not cover up domestic UFOs, but it does cover-up foreign ones. And he does not seem concerned that the principal witnesses have greatly "improved" their stories over the years. 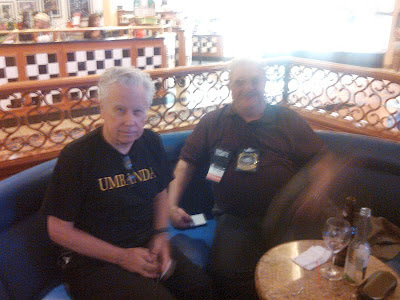 John Alexander (left) chats with James McGaha at The Amazing Meeting 2012, South Point Hotel, Las Vegas, Nevada. In a June 15, 2013 interview with radio show host Nancy Du Tetre Alexander, Alexander suddenly announced that the MJ-12 group had existed. [ii] This sudden disclosure was strange. That is because the MJ-12 controversy is central to the whole government cover-up theory believed by most in the UFO community. Yet Alexander did not talk about the MJ-12 idea in his book which had as its basic premise that there is no government control group dealing with the UFO mystery. Alexander: I think that there actually was a group and they were created something known as COG – continuity of government – and it was to prevent nuclear decapitation of the United States. It was really super super sensitive. Nancy Du Tetre: Well let me ask you this. Does MJ-12 as far as you know exist today? Cameron's story was written up by paranormal reporter Jack Brewer on The Examiner, headling "Grant Cameron reports John Alexander confirmed MJ-12," and has now become a big news story in UFO circles. Before going ballistic on this, Grant Cameron should have actually read the chapter on the alleged MJ-12 "documents" in John Alexander's book. Alexander examines the claims, and is generally skeptical of them. On p. 130, he suggests "COG - An Alternative Solution." 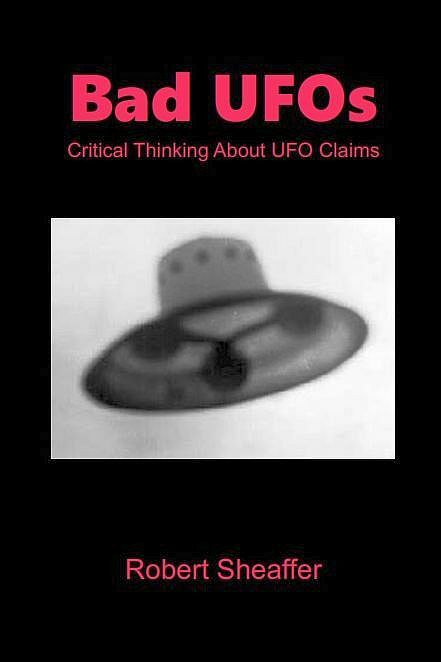 He cites a 'confidential source' he trusts who tells him that "the topics the group was involved in studying had nothing to do with the Roswell crash in particular or UFOs in general." In other words, a group existed called "MJ-12," but it had nothing to do with UFOs. He speculates that it may have been involved with "continuity of government" following a nuclear war, but he doesn't know for sure. In his book Alexander does not claim that the names of the alleged MJ-12 were "correct," but he does say "Those named as the MJ-12 constituency dovetails appropriately with a body created that might advise a POTUS." Possibly what Alexander meant in the radio interview that the names were "correct" for a COG panel. He has not yet replied to several requests for clarification, including mine. So, John Alexander was being interviewed on a radio show, and said almost exactly the same thing he had said in his book two years earlier. Grant Cameron seized upon Alexander's statement as a "sudden disclosure" and it became a big UFO news story. Lee Speigel notes in the Huffington Post that "At the recent 22nd annual International UFO Congress in Arizona , Cameron -- co-author of "UFOs, Area 51, and Government Informants" -- was honored with the researcher of the year award for his outstanding achievement in the field of UFO studies." Given that Cameron was chosen "UFO Researcher of the Year," this tells us a great deal about "UFO Research!"